The last known photograph taken of Titanic as she departs Queenstown. On April 10, 1912, the Royal Mail Ship Titanic set sail from Southampton on her maiden voyage. At 11:40 PM on April 14, 1912, she struck an iceberg about 400 miles off Newfoundland, Canada. She sank under the waves at 2:20 AM. Only 705 people were rescued; 1523 drowned or froze to death in the icy water. However, Five dogs and a pig were saved. A survivor eventually lived in Chicago near Wrigley Field. He hated baseball. That was because every time a home run was struck, the roaring crowd reminded him of the sound of all the people screaming in the water. Violet Jessop survived not only the sinking if the Titanic, but that of Britannic too. She was also aboard Olympic when it collided with the British cruiser H.M.S. Hawke. She was part of the crew and was well versed on the life boat drill. 1. The bow and stern separated completely on or near the surface allowing the stern to float free. 2. The damaged sections of double hull were damaged in the separation not the “Grounding” on the berg. 3. Confirming witness testimony, the rockets fired from Titanic were multicolored and not just white. 4. 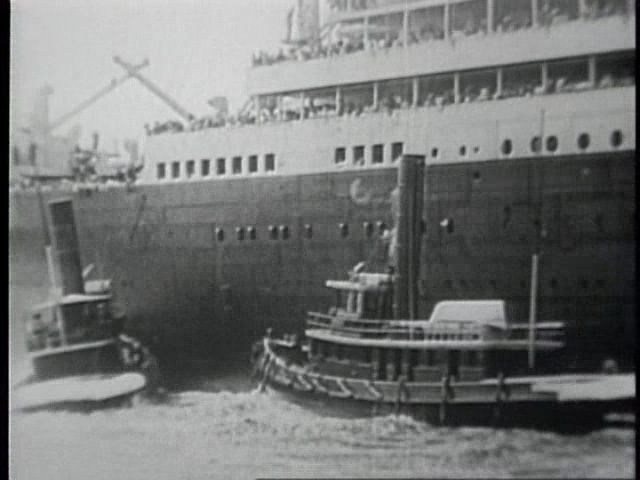 Actions by the crew to counter flood allowed the ship to remain level on a near even keel and prevented a capsizing, allowing more life boats to be launched. While over the years the iceberg has been credited for sinking the Titanic, current theory is that she was sunk by shoddy workmanship. A radical thought seeing that no expense was spared in her construction. Using the technology available at the time she was literally held together by millions of steel rivets. These steel rivets, an inch thick and of various lengths were forged with, by today’s standards unacceptable impurities of iron in the smelt. 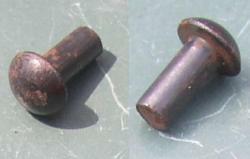 Combined with the icy low temperatures of the North Atlantic, this made the rivet brittle. Upon striking the glancing blow of the berg, the rivets failed under the tensile load placed on them opening up seams in her hull allowing far more water to enter that just the damage caused in the collision. Because the ice berg damage is buried in the sea floor and will never be seen, this theory will be perpetually debated. Current research has brought the very thickness of her hull into question. In an effort to reduce operating costs Harland and Wolfe opted to reduce the weight of the Olympic Class by using thinner hull plating. 1.875 cm for the hull and 1.25 cm for the bulkheads and superstructure. With her five forward compartments flooded, Titanic was doomed to sink. However her break up at the surface accelerated the rate. Modern sonar soundings of the wreck, coupled with eye witness testimony has revealed the slow energy failure of the hull plating. As the bow angle approached nine degrees, shear failures of the upper hull occurred resulting in cascading failures of the entire hull structure until only the thickest steel of the double bottom joined the bow and stern sections. As the bow section sank even that separated. The hull failure was totally unexpected. Had the hull remained intact the ship would have remained on the surface long enough for the crew’s life boat plan to effect the rescue of more people. 1. Trim the ship to effect the successful launching of all the life boats whether full or not. 2. The opening of the D deck gangway door to allow safe exit from the vessel. 3. The return of the life boats to receive people exiting D deck. Many pictures purported to be the R.M.S. Titanic are in fact, pictures of her sister ship Olympic. In the rush for news after the sinking these pictures were substituted to satisfy impatient newspaper editors. Only a few authentic pictures of Titanic afloat exist. Tugboat names have been obscured to mask Olympic's true identity. Workers who built the Titanic worked 14 hours a day, six days a week and were allowed seven minutes a day for bathroom breaks. The cable ship MacKay-Bennett spent seven days recovering the dead. 306 bodies were pulled from the sea with an additional 116 “returned to the sea” after services had been performed by the Reverend K.C. Hind. An Anglican minister brought aboard for that express purpose. On Friday, April 25, the Mackay-Bennett was relieved by the steamer Minia which recovered 17 more bodies, all buried at sea. Bodies being recovered by the crew of the MacKay-Bennett. First class passengers were put in coffins. Second and third class passengers were put in canvas bags. Crew members were put on ice in the hold. Click here to learn more about the victims of the Titanic. Walter Chamberlain was a first class passenger in cabin C-110. He was the 207th body recovered. NO. 207. – MALE. – ESTIMATED AGE, 40. LIGHT MUSTACHE AND – HAIR. CLOTHING – Green overcoat; dark suit; blue cardigan; blue silk pajamas. EFFECTS – Gold ring on right hand; gold with diamond on left; glasses in case; 2 fountain pens; silver match box; diamond pin; knife; keys; diamond ring; glasses; memo with pocket book; tie clip; 2 Shillings; 6 Dollars; letter case; gold wedding ring. R.M.S. Carpathia, the ship who rescued the Titanic survivors was sunk by a German U-Boat,near the end of World War One in 1918, in 171 meters (514 feet) of water off the east coast of Ireland. R.M.S. Titanic- Struck ice berg and sank April 12th, 1912. H.M.H.S. Britannic- Struck marine mine and sank on November 21st, 1916. R.M.S. Olympic- Retired in 1934. Her nickname was “Old Reliable”. 59 victims were shipped home by rail to grieving families. The rest were buried in three cemeteries in Halifax, Nova Scotia. The fourth funnel of R.M.S. Titanic was fake. It was placed there for two reasons. Aesthetics was one reason. At the time it was a common belief that a ship with more funnels was a faster ship. Thus the fourth (fake) funnel gave an impression of innate speed. While not an actual funnel, the fourth funnel had piping to allow for the ventilation of ship’s cooking stoves. Titanic did break apart during the sinking. It was felt that she broke at the expansion joint which was designed to allow the 883 foot long vessel to flex in high seas. Harland and Wolfe, builders of Titanic never admitted that this was a design flaw. However, a design strengthening the joint was incorporated in her sister ship Britannic and retro-fitted to Olympic. 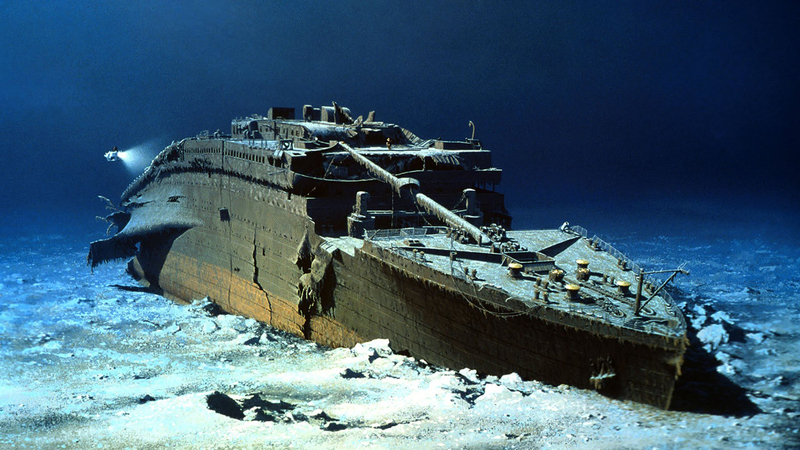 Dr Robert Ballard (Phd, Marine Geology) discovered the wreck of Titanic in the Summer of 1985. The expedition was a cover story for the covert search of the wrecks of the nuclear submarines U.S.S. Thresher(SSN -593) and U.S.S Scorpion(SSN-589). In the 1997 movie, Titanic, that’s director James Cameron’s hand that is sketching Rose. He also did the sketches in Jack’s portfolio. Cameron has been a life long fan of Titanic. He made the movie to get a chance to dive on the wreck. The money he made on the movie allowed him to further explore the wreck. On this, the 100th anniversary, he has produced for National Geographic, Titanic- The Final Word with James Cameron. The accumulation of 15 years of research, it dissects the sinking in pains taking detail. The result is a definitive description of the sinking. It’s interesting to note that Cameron is listed as “Explorer-in-Residence” and (oh yeah) filmmaker . Debunking some theories and confirming others, truth is distilled from myth and legend. If you are 27 years old or younger, the Titanic has never been lost. She lies on the sea floor in 12640 feet of water at 49° 56′ 49″ W, 41° 43′ 32″ N. She is currently being consumed by iron eating bacteria and in the next hundred years will be lost forever, reduced to a puddle of brown. Millevina Brown was the last of the Titanic survivors when she died in 2009, age 97 years. When the site of the wreck was discovered and, in her 70s, she found herself unexpectedly in demand on both sides of the Atlantic. “I think sometimes they look on me as if I am the Titanic!” she said after a visit to a Titanic convention in America. May her 1523 souls Rest in Peace. Uh oh. Here’s the other story.